Dragon is visited in prison by Malcolm and Maxine who introduce him to his grandchildren, now having been named as Amy, Jack and Tyrone. The young parents explain that when Malcolm is out serving with the Chicago Police Department that Maxine is assisted in taking care of the kids by a super-powered friend. This duty tends to be shared by either Angel or Thunder-Head, extended family members who can be trusted with the kids’ care. As time passes on, the triplets grow older and cause a number of issues for their parents and babysitters. Both Angel and Thunder-Head have their clothes torn off at separate times in front of Maxine, much to their embarrassment. They are taken to see Lorella for a check-up and Maxine explains that despite the damage the infants have caused, they have not once come close to hurting her, presumably recognizing their mother as more fragile and not wanting to hurt her. Lorella once more has a finger broken by one of the kids as she holds them. 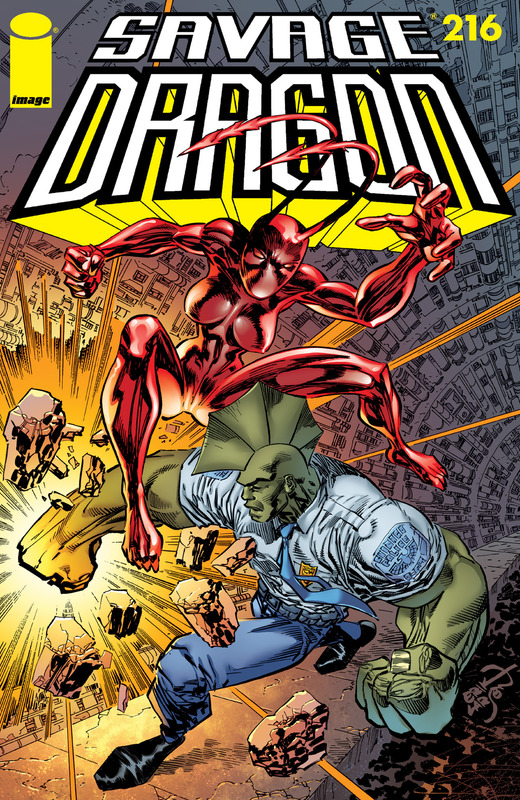 Malcolm continues to bring in numerous super-powered threats, things having not slowed down since Dart’s apprehension. One of Malcolm’s fellow cops notes that the Vicious Circle has suffered tremendous losses recently, especially at the hands of their own leader. Yet even with their ranks thinned, Malcolm is kept as busy as ever. This apparent mystery is shrugged off by Malcolm as the next emergency call comes through. An invasion of the surface world by the Ant Menaces has begun and Malcolm Dragon has been sent in to fend off this assault. He battles against this army as they try to emerge from the hole in the ground. Ant joins the fray but Malcolm mistakenly believes her to be part of the enemy army and strikes her. Ant quickly recovers and assists Malcolm, assuring him that she is a fellow hero and the pair soon drives back the Ant Menaces.